I arrive at the tiny Apia airport, on the island of Upolu, in Samoa, barely one hour before my flight but the counter, and the entire airport for that matter, has yet to open. There are a few passengers sitting and chatting around the hall and a line of suitcases queueing in front of the unmanned check-in counter. The entire set-up looks more like a bus station than an international airport. It is not the first time I am acquainted with the place, I landed in the same tarmac a week before, from Fiji, which now seems like a buzzing metropolis. I try counting the number of passengers and realize that, either the plane will be empty, or it will be tiny. There are, however, more kilos in all the small mountains of luggage scattered around than in human weight, despite the severely obese American Samoan population. Eventually, the personnel from Samoa Air shows up and starts checking in. The owners of all the suitcases come up to the rescue. Both passengers and luggage are weighted in. There is no place to wait or buy any food or drinks so I sit down and scrutinize the tarmac, looking for the aircraft. I see a small 19-seater propeller plane. As soon as I step into the plane I see a strange 2-1 seat configuration: the 2-seater right side of the plane is a bench without a separation armrest in the middle. Our luggage makes an entrance and is strapped on the empty seats, at the back of the plane, as if each suitcase was a passenger. That is why there were so few passengers checking-in, suitcases were counted as passengers. For such a short flight, people seem to be traveling with their entire lives. It must be the Pacific version of the trip North African immigrants in France make through Spain every summer, mattresses and all strapped on the car roofs. 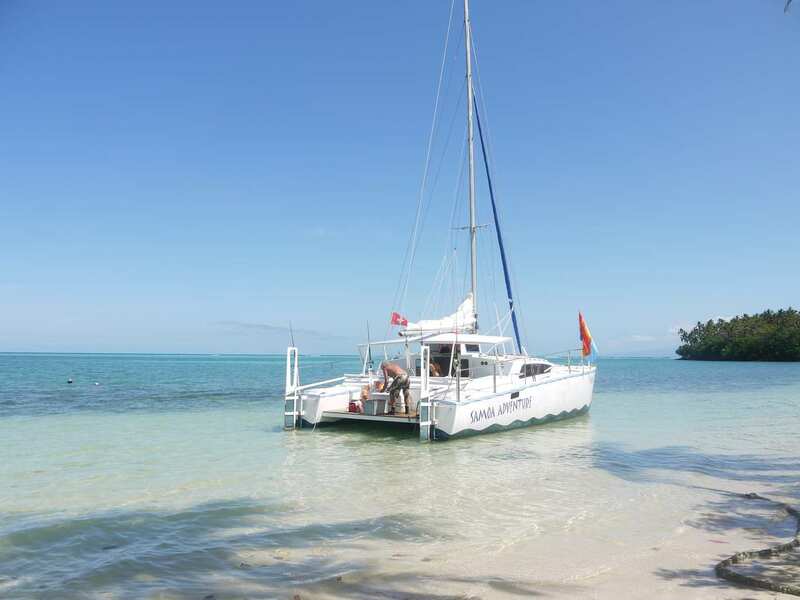 This is one of only two ways to reach such an isolated South Pacific Island, the other one being via Hawaii.. The reality of the bench-style seats is apparent as soon as I get to my seat: they are big enough for two “regular-sized” passengers or one large Samoan. The issue is that, in my case, they are trying to fit the skinny tourist with an oversized local and it just is not working. Half of my body and my left leg end up hanging off for the entire flight. Needless to say, I know what seat to ask for on the way back. When I land on American Samoan soil I am, effectively, in the US, and I have traveled back in time: it was, again, my birthday! “Wouldn’t it be cool to do this on New Year’s Eve?” I think to myself. I left Western Samoa on the morning after my 32nd birthday. I celebrated my birthday on Savaai, the smaller of the two main Samoan islands, with fabulous white sand beaches and hotels mimicking the local “fale” houses with no walls, just a roof. 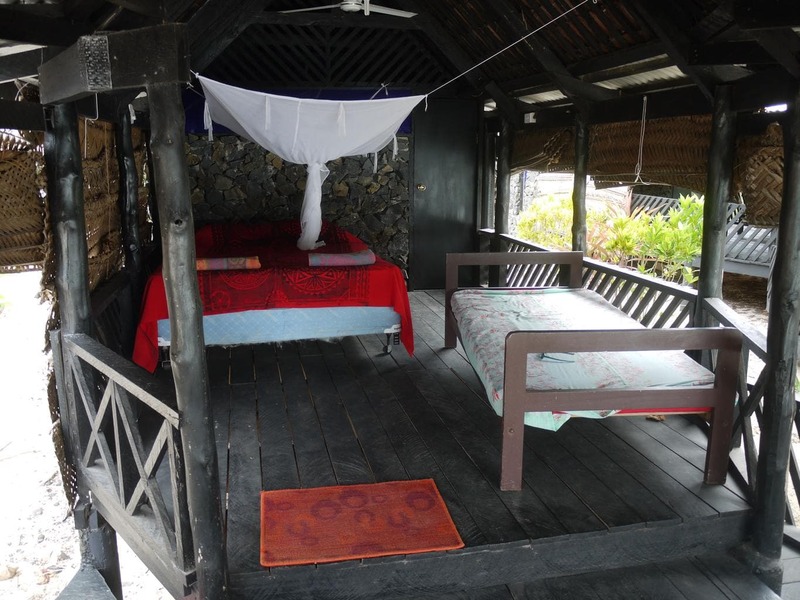 The sound of the waves, about a meter away from my beach hut, had lulled me to sleep on that special day I had devoted to myself. Saavai has a unique way of welcoming the very few tourists who made it to that end of the world. 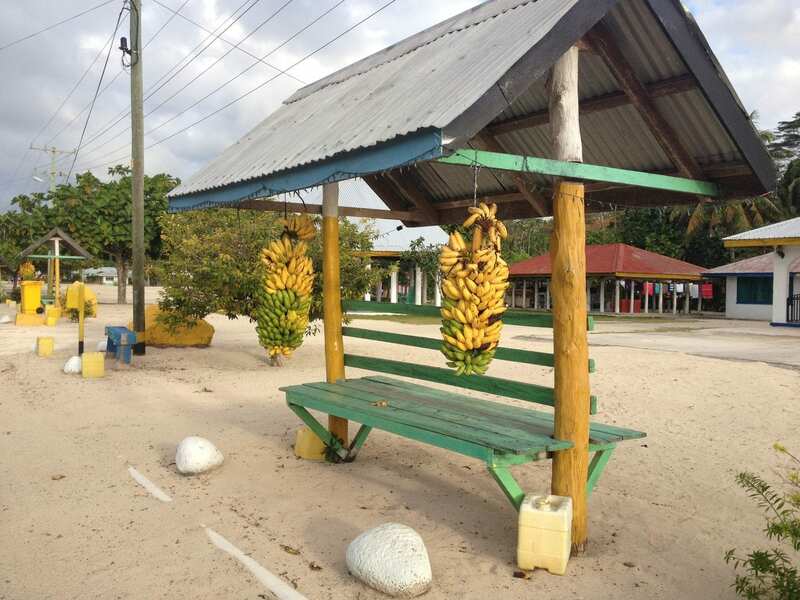 Locals hang bananas on the bus station for tourists to enjoy and there are no dogs. Practically nobody wears shoes and given the way everybody lives, in the open, it is about the safest place in the world. In the evening,back on the main island of Upolu, I met my Spanish dive instructor. It was indeed a revelation to find another Spaniard on this remote Pacific island. We bought Indian take-away and devoured it in his jungle hut with rats fighting on the roof and cockroaches running around. It was comfortable to be able to speak a familiar language and laugh the way you can only laugh with someone you share a list of childhood TV programming with. We had to leave the leftovers in the boxes, on top of the mosquito spray bottles to prevent the cockroaches and other insects from accessing them. 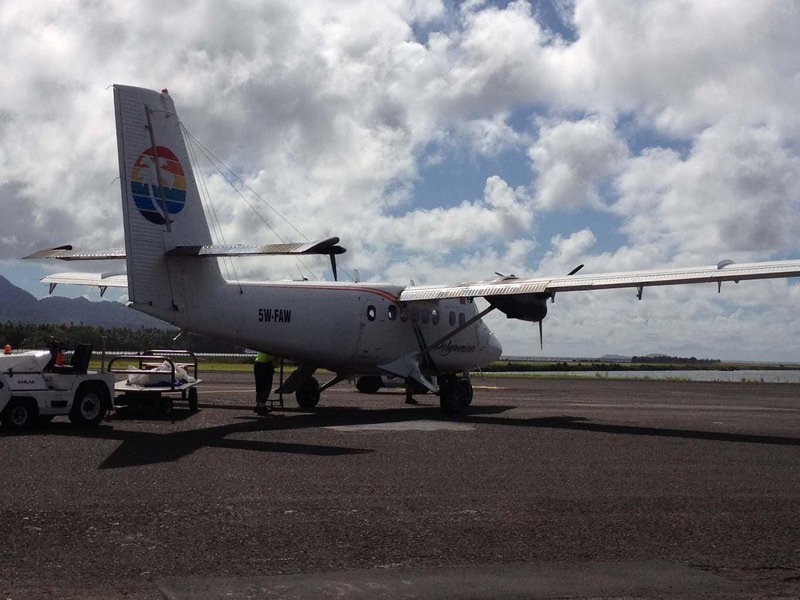 I walk out of the tiny plane in Pago Pago, American Samoa’s capital, as the feeling on my left leg slowly returns. I am greeted by American Border Police who does not pay much attention to the usual US security protocols. Island Life at its best. In fact, the security checks were so thin that, on the way back, I managed to board the plane without my passport being stamped as there was no officer when I passed through the Immigration Control so, unknowingly, I just went through. 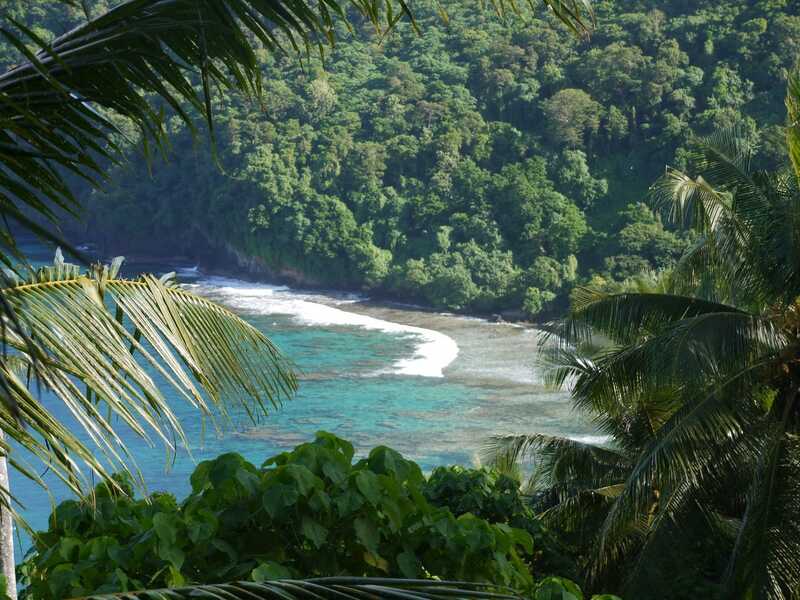 After almost two months roaming the quieter Pacific islands, American Samoa was a shock. Within the first hour I drive past several petrol stations, two McDonald’s and a few shopping malls. With it, also comes the second most obvious difference: obesity, something which is starting to be a theme in some South Pacific nations but which is extreme in American Samoa, affecting as high as 94% of the population according to the World Health Organization. American Samoans are twice the size of their neighbors half an hour flight away. Instead of the usual built frames and strong men that have made New Zealand’s rugby team unbeatable, I see large bellies. Originally from the same ancestors, American Samoa mother land’s penchant for fast-food and the relatively cheap price of junk food compared to the expensive imported healthy options is having a terrible impact on the wellness and health of the population. This tiny American unincorporated territory thrives on tuna fishing, with a canning factory in the middle of the island clearly standing out, and smelling the part. Its second most important role is as a naval strategic position South of the Pacific. The recruitment center for the Army on Pago Pago ranks first in number of soldier enlistment in the entire US. The economic hardship on this isolated part of the world, where traditional self-sufficient agriculture was long ago abandoned, pushes the youth to enlist. But, despite their high levels of patriotism, Samoans are only US nationals, but not citizens and so they can’t vote for President. The island is the southernmost US territory and, together with Jarvis Island, the only South of the Equator. After spending the night on a traditional fale in Samoa, the brick and mortar buildings on the American side are a contrasting sign of development. The ways of life are also dramatically different. The two Samoa split at the end of the 19th century during the Treaty of Berlin when the World’s Powers divided the world. Western Samoa became German territory at first and eventually achieved independence from New Zealand in 1962, being the first island-state in the Pacific to do so. Fifty years later, the differences between the two countries are extreme. Whereas Western Samoa evolved slowly and is still a lost paradise of white sand beaches, rugged mountains, cliffs and incredible beauty, American Samoa has fewer sand beaches, it is significantly smaller and it is one of the least visited places in the world. Not that Samoa receives a whole lot more visitors. On my trip down to the Tourism Office I ended having the tourist officer all to myself on a personal tour of the island. She had not seen a tourist in days. It is believed that fewer than 5,000 people make it to this last frontier. The level of development that American Samoa experienced also gave way to modern life while leaving the traditional ways of life, the Fa’a Samoa, in the past. American Samoa has been largely Americanized and chief titles or traditional ceremonies have generally disappeared. 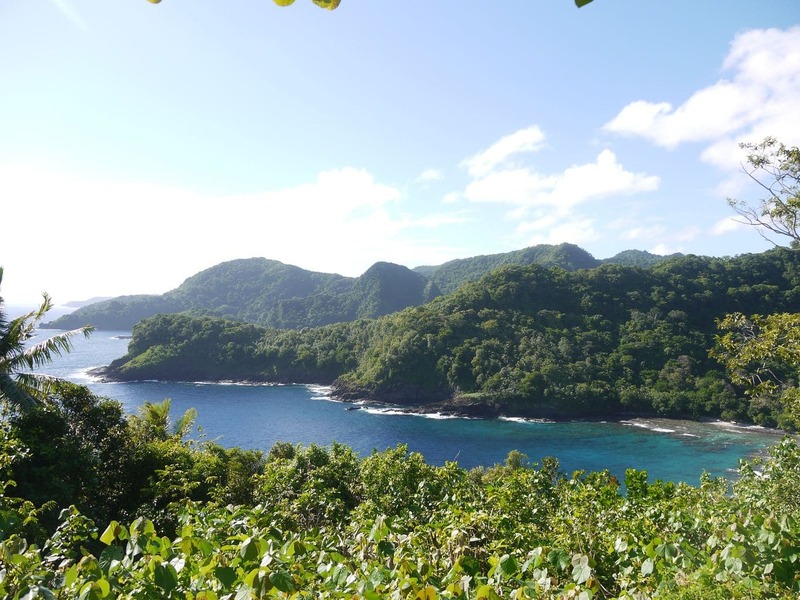 Despite the apparent level of development that hits the visitor as soon as the airport is left behind, a look under the skin makes it obvious that American Samoa is not the happy go lucky neighbor of Western Samoa. Despite their geographical proximity, the two countries are as far from each other as their time difference. Standing at either side of the dateline, Western Samoa wakes up first in the world, every day, whereas Samoans are the last ones to go to bed. It is therefore the same time in both places, only a day apart. One can’t help but wonder if progress and modernization is what has made the difference between the two and if, after all, this was good or bad for the population.